October 16, 1929 was a special day at Elon College. That was the day the O’Kelly Memorial Marker that stands between Alamance and Long buildings was dedicated with President W. A. Harper presiding. Dr. E. L. Moffitt and Dr. W. W. Staley took part in the program, as did soon-to-be-president Dr. L. E. Smith. The marker recognized and honored the importance of Reverend James O’Kelly in the founding of the Christian Church, which subsequently founded Elon College. According to Dr. James Earl Danieley, President Emeritus of Elon University, the urn was generally taken at Halloween as a student prank. It was always returned and life went on. However, one Halloween the urn was not returned and was found near a garbage dump! It was decided that the urn would be replaced with a copper cross firmly fastened to the monument. So, here’s the timeline in a nutshell: 1929-1944, the urn was on the monument; 1945-1966, the urn was missing; 1967-present, the copper cross was on the monument and the O’Kelly memorial was complete. This entry was posted in Campus buildings, Campus Spaces. Bookmark the permalink. My name is Burke R. O’Kelly, a fourth generation descendant of James O’Kelly (William J., Lewis J., Vernon D.). My wife and I visited the Elon College Campus in 1981 to see the Memorial to Rev. James O’Kelly. We were warmly welcomed by the receptionist in the President’s office and viewed the Memorial. a very nice visit. Thank you. Hi Burke! Thanks for your comment! 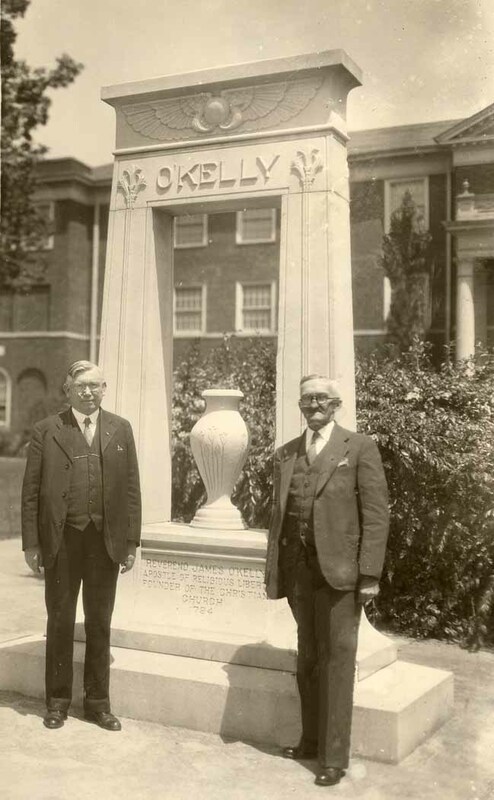 We are happy to hear about your visit to the campus–you should come back as much has changed, but the O’Kelly monument still stands between Alamance and Long buildings.